Background: Thalassemias are an important cause of morbidity and mortality worldwide. They create a huge emotional and financial deficit on the affected individuals and their families, society and the country. However, severely symptomatic disease can be prevented by various methods. Aims: The present study was undertaken with an aim to find the prevalence of carriers of thalassemia and other hemoglobinopathies in pregnant females and their husbands so as to identify the couples at risk of having severely affected children. Materials and Methods: The study included 2000 antenatal patients of microcytic hypochromic anemia detected on routine hematological examination. Various formulae used to differentiate between thalassemia and iron deficiency anemia were calculated. Serum ferritin levels were performed, and cases with normal or high serum ferritin were analyzed for hemoglobin variants by high-performance liquid chromatography using Bio-Rad variant II hemoglobin testing system-beta thalassemia short program. Results and Conclusion: Sixty-three of the 2000 women screened (3.15%) were identified as carriers of beta thalassemia trait and other hemoglobinopathies. Most of them that is 59 cases (2.95%) were beta thalassemia carriers while one each were carriers of HbE (0.05%), HbS (0.05%), HbD (0.05%), and double heterozygous for beta thalassemia and HbE. 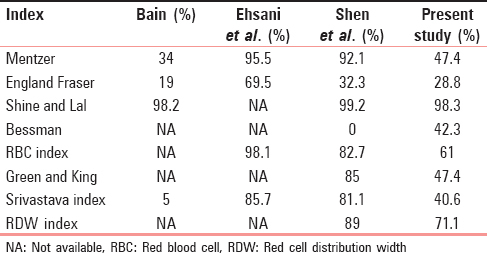 Among the various indices evaluated in the present study, Shine and Lal index could identify almost all cases of beta thalassemia carriers (98.3% sensitivity) whereas all the other indices could not be relied on in the identification of all the cases. The thalassemias and the related hemoglobinopathies are autosomal recessive conditions affecting the quantity and quality of hemoglobin molecules in red blood cells. These disorders are found more commonly in certain populations and ethnic groups. They have been known to occur in high frequency in the belt extending from the Mediterranean basin through the Middle-East, Indian subcontinent, Burma, Southeast Asia, and islands of the Pacific but are now common worldwide due to rampant migration., Worldwide, 5.2% of the population and more than 7% of pregnant females carry a significant variant. 1.1% of couples are at risk for having children with a hemoglobin disorder, and 2.7 per 1000 conceptions are affected worldwide. In children aged <5 years, hemoglobin disorders contribute 3.4% of mortality worldwide. In Southeast Asia, every year there are 4.13% conceptions affected with hemoglobinopathies, according to data published in the WHO Bulletin 2008. Of these, 90% are beta-thalassemia and 4.3% are alpha-thalassemia. A significant proportion, 8 lakh out of 91 lakh (10%) of pregnant carriers belong to Southeast Asia. Annually, 1.9 lakh pregnancies occur in carrier couples of which around 30% are actually at risk of giving birth to a thalassemic child. In India, about 15,000 infants are born each year with hemoglobinopathy of which over 9000 children have beta thalassemia major., The overall prevalence of beta-thalassemia trait has been reported to be 2.78% and varies from 1.48% to 3.64% in different states of the country. The overall prevalence of HbE trait was reported as 3.63%. A hospital-based study reported 5.9% of females screened in antenatal period to have thalassemia trait. The present study was undertaken with an aim to find the prevalence of carriers of thalassemia and other hemoglobinopathies in pregnant females and their husbands so as to identify the couples at the risk of having severely affected children. This observational study was conducted in the Department of Pathology in collaboration with the Department of Obstetrics and Gynaecology of a hospital in Delhi from 2010 to 2013. The study included 2000 patients with microcytic hypochromic anemia, attending the antenatal clinic of the hospital. Patients already diagnosed with a hemoglobinopathy or iron deficiency anemia or those who had received blood transfusion in past 1 month were excluded from the study. Clinical details of the patients included in the study were recorded on a predesigned pro forma. Blood samples were collected in ethylenediaminetetraacetic acid and plain vacutainers from each patient after informed consent. Erythrocyte indices were assessed using Sysmex KX21 and peripheral blood smears were examined. All cases with microcytosis (MCV <77 fL) and hypochromia (MCH <27 pg) were tested for serum ferritin levels. Serum ferritin was performed using ferritin enzyme-linked immunosorbent assay kit (10461, Calbiotech, USA) according to manufacturer's instructions. Cases with low serum ferritin levels (normal value: Men - 20–350 ng/ml; women - 10–200 ng/ml) were tested again after a course of iron replacement therapy for 4 weeks and reassessed for MCV, MCH, and serum ferritin values, wherever possible. Microcytic hypochromic anemia cases with normal or raised serum ferritin levels were analyzed for hemoglobin variants by HPLC using Bio-Rad variant II hemoglobin testing system-beta thalessemia short program. A diagnosis of beta-thalassemia carrier was made when HbA2 >3.5%. Carriers of other hemoglobinopathies were detected by the presence of the particular abnormal hemoglobin. Reticulocyte preparation was also made from anticoagulated blood by the use of 1% methylene blue in all cases with microcytic hypochromic indices. HbH inclusion bodies were looked for in the incubated reticulocyte preparation for the detection of alpha thalassemia carriers. Partners of all hemoglobinopathy carriers were screened. If both partners were found to be carriers, they were referred for counseling and diagnosis to detect thalassemia carriers. The age range of 2000 patients was 18–34 years, mean age being 23.85 (standard deviation [SD] ± 2.64) years. Most of the women included were primigravidas (1998 out of 2000); only two women were multigravidas. Most women attended the antenatal care (ANC) clinic in the first trimester (63.7%), 33.85% in second trimester and 2.45% in the third trimester. Patients included in the study belonged to the National capital region and surrounding states. Most of the women belonged to low socioeconomic status and were mainly homemakers. Sixty-three of the 2000 women screened (3.15%) were identified as carriers of beta thalassemia trait and other hemoglobinopathies. Most of them that is 59 cases (2.95%) were beta thalassemia carriers while one each were carriers of HbE (0.05%), HbS (0.05%), HbD (0.05%), and double heterozygous for beta thalassemia and HbE. Majority of the women attending the ANC clinic were Hindus (68.2%), followed by Muslims (29.1%). History of consanguinity could be elicited in 130 Muslim women. Of the seven, Muslim women having beta thalassemia trait, four were descendants of migrants from Pakistan. No family history of hemoglobin disorders could be elicited from any case, but this could be a result of ignorance or a fall out of the social stigma attached to the chronic debilitating disease. However, an year old son of a pregnant beta-thalassemia carrier was diagnosed as thalassemia major during the present study. 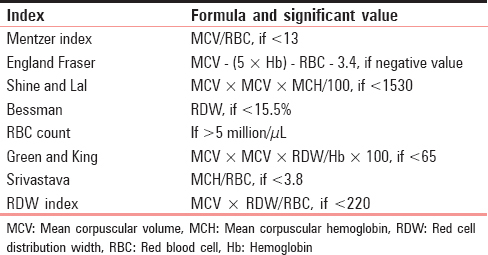 Hemoglobin levels of all cases varied from 5.3 to 15.9 g/dl, mean hemoglobin being 9.96 g/dl. Of the 2000 patients, 1163 cases (58.15%) had microcytic hypochromic indices (MCV <77 fL and MCH <27 pg). The MCV for these 1163 patients ranged from 72 to 77 fL; mean 75.7 fL (SD ± 4.16) and MCH ranged from 24 to 27 pg; mean 25.95 (SD ± 3.08). Of the 1163 microcytic hypochromic cases, 1100 cases were diagnosed with iron deficiency anemia with ferritin ranging from 2.4 to 9.9 ng/ml; mean ferritin 8.11 ng/ml. Remaining 63 cases with microcytic hypochromic indices were found to have hemoglobinopathy, of whom 59 were cases of beta thalassemia trait, one case each of HbE, HbS, and HbD heterozygous, and one case was double heterozygous for beta thalassemia trait and HbE. No carrier of alpha thalassemia was detected. All beta thalassemia carriers had elevated Hb A2 levels ranging from 3.6% to 7% with a mean of 5.21%. The HbF levels in beta thalassemia cases ranged from 0.2% to 2.9% with a mean of 1 (SD ± 0.68). The levels of various hemoglobins in other hemoglobinopathy cases are shown in [Table 2]. Among the various indices evaluated in the present study, Shine and Lal index could identify almost all cases of beta thalassemia carriers (98.3% sensitivity) whereas all the other indices could not be relied on in identification of all the cases. Husbands of 59 pregnant hemoglobinopathy carriers turned up for screening, two of whom were found to be carriers of beta thalassemia trait. The two at-risk couples were advised to undergo prenatal diagnosis. A flow chart outlining the results is shown in [Figure 1]. Thalassemias are an important cause of morbidity and mortality worldwide. They create a huge emotional and financial deficit on the affected individuals and their families, society, and the country. Therefore, numerous screening programs to identify disease carriers have been proposed. The goal of all screening programs is to prevent the birth of individuals affected with disease. Screening can be of various types-screening of general population, screening of high-risk communities, screening of family members of affected individuals, premarital screening, and antenatal screening. Screening of general population is impractical in India. Cascade screening of extended family members of thalassemics allows identification of large number of individuals at risk by screening only a small fraction of the general population, and as relatives of children with thalassemia major have experienced the stress on the family, they would therefore come forward more easily for carrier screening. Premarital screening in adults would be the ideal screening program as individuals could exercise choice in the selection of partners, understand the need for definite prenatal diagnosis, time may be gained by individuals to adjust to their carrier status, and pregnancy may be reported early. It is however not feasible in India because of the custom of arranged marriages where social stigma attached with the disease prevent them from getting suitable matches. Screening of pregnant women in antenatal clinic is feasible and may be the best-suited program in larger towns and cities of India because many pregnant women come for antenatal checkup. All those patients who turn out to be thalassemia carriers should be counseled and their partners screened for thalassemia. In the present study, most patients reported in the first trimester of pregnancy, thus allowing the possibility of prenatal diagnosis and medical termination of pregnancy if required. Lack of education and general unawareness about the disease makes husbands of carriers reluctant to get themselves screened for the disease as was also reported by Colah et al. In the present study also, the couples at-risk refused to get a prenatal diagnosis even after proper counseling. It is expected that the level of acceptance for screening and prenatal diagnosis will be even lower in villages and remote areas of the country. Therefore, both government and nongovernment organizations need to spread awareness about the disease so that an effective screening and control program can be setup. In the present study, the carrier frequency of beta-thalassemia was 2.95% and that of sickle cell trait, HbE trait, HbD trait, and E-beta thalassemia trait was 0.05% each. This is comparable to the frequency reported by Colah et al. and Madan et al., In the present study, HbF was elevated (1%–3%) in 42% of beta-thalassemia trait cases. Elevated HbF has been reported in up to 50% cases of beta-thalassemia trait usually ranging from 1 to 3% and rarely >5%. The case of sickle-cell trait had almost 30% HbS, but the levels of HbF (9.1%) and HbA2 (5.3%) were raised. In patients with sickle cell trait, HbA2 is 2%–4% and HbF <1%. HbF may be increased in pregnant women with sickle cell trait and HbA2 is increased due to formation of HbS adducts which co-elute with HbA2 on HPLC. Most hospital based studies rely on the MCV and MCH value as the first step in screening for thalassemia. Detection of hemoglobinopathic carriers cannot be reliably performed by complete blood count alone as it may fail to detect few carriers of HbS, HbC, HbD, or HbE who may have a normal MCV or MCH. Since majority of hospitals in India may not be equipped with HPLC instrument for thalassemia screening and may have to rely only on erythrocyte indices for detection of carriers and a comparative analysis of the various formulae used was performed. The exact magnitude of the hemoglobinopathy problem in India is obscure. Only hospital-based data, which may not be representative of the whole population are available. In this study, 3.15% of antenatal women with microcytic hypochromic anemia were identified as carriers of beta-thalassemia trait and other hemoglobinopathies. Most of them, 2.95% were beta-thalassemia carriers while one each were carriers of HbE (0.05%), HbS (0.05%), HbD (0.05%), and double heterozygous for beta thalassemia and HbE. Among the various indices evaluated in the present study, Shine and Lal index could identify almost all cases of beta-thalassemia carriers (98.3% sensitivity) whereas all the other indices could not be relied on in identification of all the cases. In view of the morbidity, mortality, and emotional and financial burden of thalassemia, ait would be in national interest to have a thalassemia screening program. Greer JP, Arber DA, Glader B, List AF, Means RT, Paraskevas F, et al. Wintrobe's Clinical Hematology. 13th ed.. PA, USA: Lippincott Williams & Wilkins; 2014. Balgir RS. The burden of hemoglobinopathies in India and the challenges ahead. Curr Sci 2000;79:1536-47. Gorakshakar AC, Colah RB. Cascade screening for beta-thalassemia: A practical approach for identifying and counseling carriers in India. Indian J Community Med 2009;34:354-6. Mohanty D, Colah RB, Gorakshakar AC, Patel RZ, Master DC, Mahanta J, et al. Prevalence of ß-thalassemia and other haemoglobinopathies in six cities in India: A multicentre study. J Community Genet 2013;4:33-42. Gupta V, Sharma P, Jora R, Amandeep M, Kumar A. Screening for thalassemia carrier status in pregnancy and pre-natal diagnosis. Indian Pediatr 2015;52:808-9. Maheshwari M, Arora S, Kabra M, Menon PS. Carrier screening and prenatal diagnosis of beta-thalassemia. Indian Pediatr 1999;36:1119-25. Lafferty JD, Crowther MA, Ali MA, Levine M. The evaluation of various mathematical RBC indices and their efficacy in discriminating between thalassemic and non-thalassemic microcytosis. Am J Clin Pathol 1996;106:201-5. Mentzer WC Jr. Differentiation of iron deficiency from thalassaemia trait. Lancet 1973;1:882. England JM, Fraser PM. Differentiation of iron deficiency from thalassaemia trait by routine blood-count. Lancet 1973;1:449-52. Shine I, Lal S. A strategy to detect beta-thalassaemia minor. Lancet 1977;1:692-4. Bessman JD, McClure S, Bates J. Distinction of microcytic disorders: Comparison of expert, numerical-discriminant, and microcomputer analysis. Blood Cells 1989;15:533-40. Klee GG, Fairbanks VF, Pierre RV, O'Sullivan MB. Routine erythrocyte measurements in diagnosis of iron-deficiency anemia and thalassemia minor. Am J Clin Pathol 1976;66:870-7. Green R, King R. A new red cell discriminant incorporating volume dispersion for differentiating iron deficiency anemia from thalassemia minor. Blood Cells 1989;15:481-91. Srivastava PC. Differentiation of thalassaemia minor from iron deficiency. Lancet 1973;2:154-5. Jayabase S, Giavanelli J, Levendoglu-Tugal O, Sandoval C, Ozjaynak F, Visintainer P. Differentiating iron deficiency anaemia from thalassemia minor by using an RDW based index. J Pediatr Hematol 1999;21:314. Colah R, Surve R, Wadia M, Solanki P, Mayekar P, Thomas M, et al. 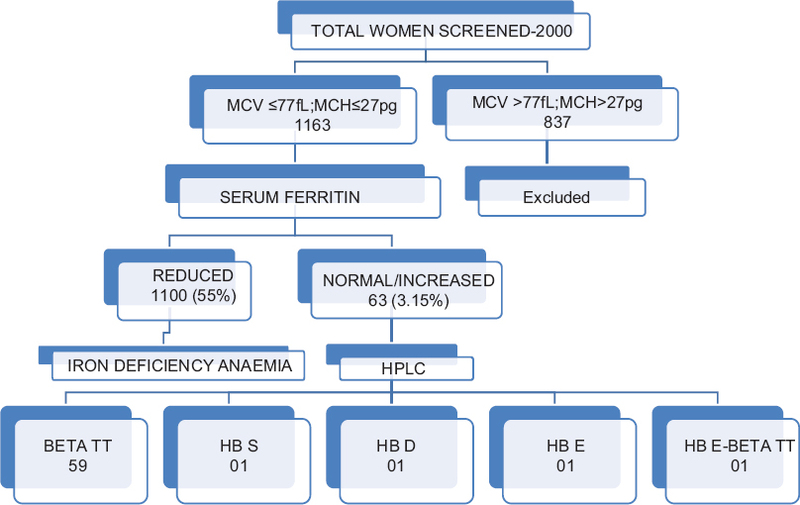 Carrier screening for beta-thalassemia during pregnancy in India: A 7-year evaluation. Genet Test 2008;12:181-5. Madan N, Sharma S, Sood SK, Colah R, Bhatia LH. Frequency of ß-thalassemia trait and other hemoglobinopathies in northern and western India. Indian J Hum Genet 2010;16:16-25. Kotila TR, Adeyemo AA, Mewoyeka OO, Shokunb WA. Beta thalassaemia trait in Western Nigeria. Afr Health Sci 2009;9:46-8. Bain BJ. Screening of antenatal patients in a multiethnic community for beta thalassaemia trait. J Clin Pathol 1988;41:481-5. Ehsani MA, Shahgholi E, Rahiminejad MS, Seighali F, Rashidi A. A new index for discrimination between iron deficiency anemia and beta-thalassemia minor: Results in 284 patients. Pak J Biol Sci 2009;12:473-5. Shen C, Jiang YM, Shi H, Liu JH, Zhou WJ, Dai QK, et al. Evaluation of indices in differentiation between iron deficiency anemia and beta-thalassemia trait for Chinese children. J Pediatr Hematol Oncol 2010;32:e218-22.